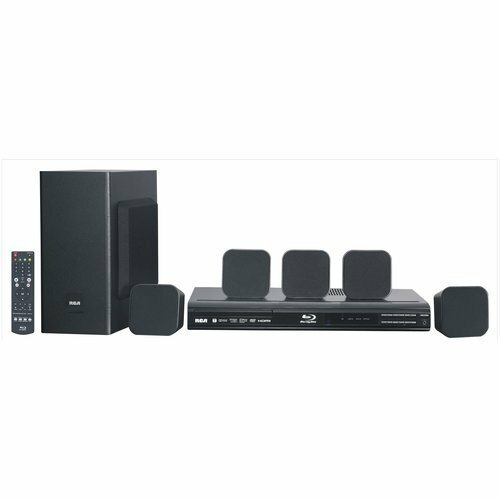 This RCA RTB10323LW Home Theater System with Blu-ray Player is all you need for enjoying Blu-ray Discs, DVDs or online VUDU HD movies with an authentic home theater surround sound experience. It's also equipped with VUDU Apps and Pandora Internet Radio. Connect it to the Internet using the built-in WiFi connectivity and enjoy personalized online music streaming, stay connected with friends, get news, weather and much, much more. The system includes five speakers, subwoofer and full-function remote control. Its HDMI output provides a 1080p high-definition digital video signal to your TV, while its AUX input can be used to connect AV equipment such as a cable or satellite box.